Mistletoes all over the world have very interesting interactions with other species, and not just with their hosts. Most also form miniature ecosystems of their own, with specialist birds, insects and fungi. This page outlines some of the biodiversity value of mistletoe in Britain, with bird species at the top and insect species below. Links to some information sheets are given at the end of the page. There are two key background issues for European mistletoe with regard to birds. Firstly it relies entirely on winter birds for berry, and therefore seed, distribution – so birds are essential. Secondly the white sticky berries of Viscum album are not attractive to many birds – many ignore them as they are looking for red, orange, black or blue berries (mistletoe is the only native British species with white berries) and even if they try them the birds are put off by the super-glue quality of the berry pulp. So which birds do take mistletoe berries? In Britain the answer is largely Mistle Thrushes, whose common name and latin name, Turdus viscivorus, hint at a mistletoe specialism. Other thrushes – including Redwings, Fieldfares etc will also eat the berries. 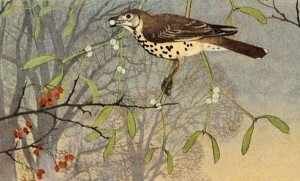 But Mistle Thushes aren’t really mistletoe specialists, despite their name, as they occur commonly across the country in areas with no mistletoe, where they will eat any berries. Furthermore they’re not really very efficient at spreading mistletoe. They usually swallow the whole berry, seed and all, excreting a mass of semi-digested berry pulp and seeds about 30 minutes later. Some of those seeds, still sticky, may stick to a branch where they can germinate. Most will not – often hanging uselessly below a branch (see picture on the right). 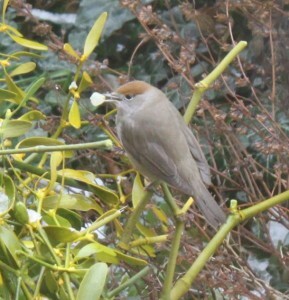 A few other birds will eat mistletoe too, including Waxwings and a few other relatively uncommon species, but the most efficient mistletoe spreading species is the Blackcap. These smart little birds only swallow the berry skin and pulp, wiping each seed off their beak before swallowing – and so they are much more efficient than Mistle Thushes. Specialist insect associations are a common feature of mistletoes worldwide – and ours is no exception, with six species known on mistletoe in Britain. 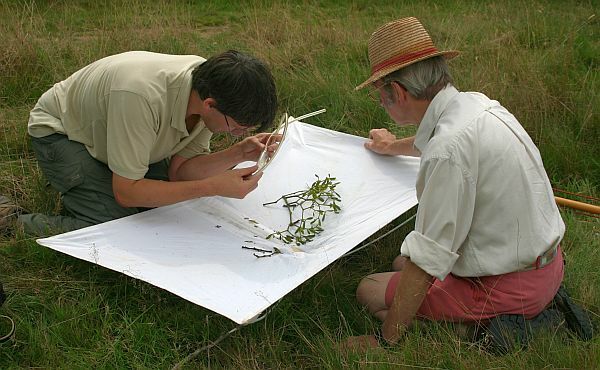 All are considered rare and worthy of conservation, though actually very little is known about how frequent they are – sampling insects on mistletoe is quite difficult so there are large gaps in the data. 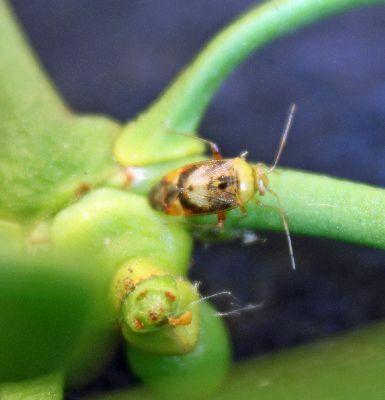 Four of the six are bugs and some are rather obscure – including the psyllid bug Cacopsylla visci, which looks similar to many other species-specific psyllids. The mirid bug Pinalitus viscicola is more distinctive, and has been known in Britain for over 100 years, living on mistletoe on various hosts and habitats across the country. Another mirid bug Hypseloecus visci is ‘new’ to Britain, known only since 2003. Since its discovery here it has been recorded across mistletoe’s main distribution area and also further east, notably on lime and hawthorn. 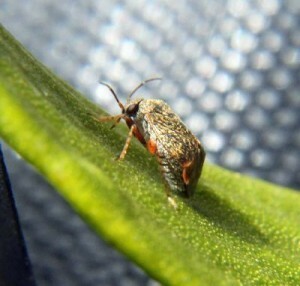 Those first three bugs feed on mistletoe itself but the fourth bug, Anthocoris visci, is a predatory species, thought to feed on the psyllid. 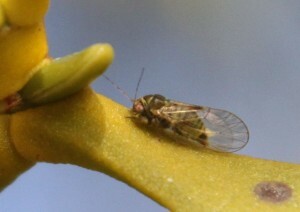 This species occurs across the country, on mistletoe on a variety of host trees. Most conservation work on mistletoe invertebrates is directed at the Mistletoe Marble Moth, Celypha woodiana, as this is a Priority Species in the UK BAP a Species of Principal Importance in England under the NERC Act 2006. 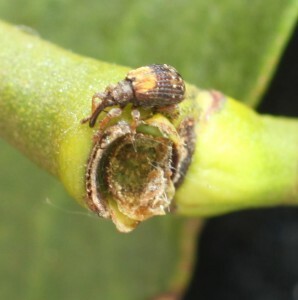 Known in Britain since 1878 it has larvae that live on mistletoe leaves in blister mines. A factsheet on this species is available from Butterfly Conservation. Our last mistletoe insect is the mistletoe weevil Ixapion variegatum. This is another ‘new’ species, only known in Britain since 2000. 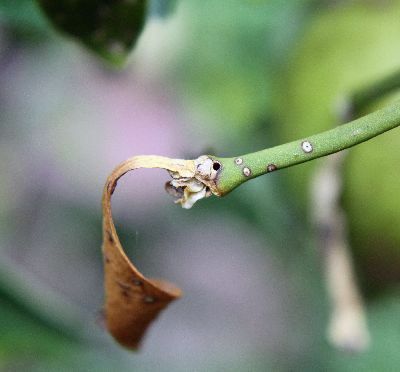 The larvae live inside the stems of mistletoe, usually just below the terminal bud during the summer months, and on emerging as adults that bud (which is next year’s flower bud) often dies. An information sheet about mistletoe’s bird and insect associates can be downloaded here. 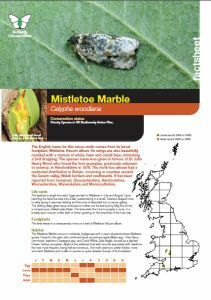 Information about the Mistletoe Marble Moth is available in a downloadable factsheet produced by Butterfly Conservation. You can download the factsheet by clicking here or on the image on the left. For more information about Butterfly Conservation visit their website here.